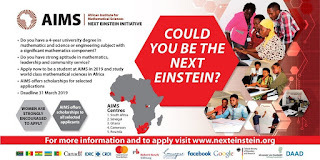 African Institute for Mathematical Sciences (AIMS) Master’s & Co-operative Master’s Program Eligibility, Centers, Benefits and Application Guidelines for 2019/2020 Session. The African Institute for Mathematical Sciences (AIMS) is pleased to announce that it has opened applications for its Master’s & Co-operative Master’s Program at its five centres of excellence for the 2019/2020 Academic year. 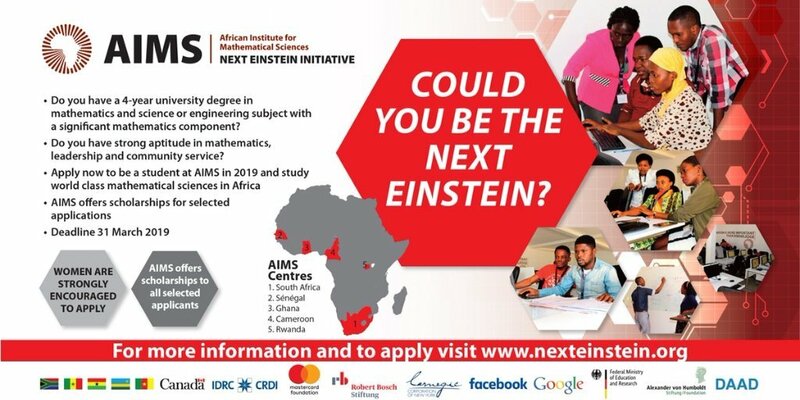 AIMS is a pan-African network of centres of excellence enabling Africa’s talented students to become innovators driving the continent’s scientific, educational and economic self-sufficiency. They enable Africa’s brightest students to become innovators that propel scientific, educational and economic self-sufficiency. Do you have a four-year university degree in mathematics and science or engineering subject with a significant mathematics component? Do you have strong aptitude in mathematics, leadership and community service? Apply now to be a student at AIMS in 2019 and study world class mathematical sciences in Africa. Why Should You Apply for AIMS Master’s Program. Their courses are taught by outstanding African and international lecturers and supported by a team of resident tutors. AIMS graduates progress to top advanced degree programs and careers in Africa and all over the world. They have a climate of highly interactive teaching where students are encouraged to learn together through questioning and discovery. They place emphasis on computational methods and scientific computing with 24/7 access to computer labs and the internet. Both students and lecturers share a 24-hour learning environment. Applicants must have a conferred 4-year university degree in mathematics and science or engineering subject with a significant mathematics component or anticipate completing by the start date of the AIMS course. Applicants should demonstrate a strong aptitude in mathematics, leadership and community service. Women applicants are strongly encouraged to apply. Potential applicants must demonstrate both a high degree of motivation and the ability to complete the course successfully. Late applications will be considered on a case-by-case basis. Master’s degrees are awarded in partnership with leading local academic institutions affiliated with AIMS centers. There are no course fees for successful applicants. Full bursaries covering tuition, accommodation, meals, and travel costs are also awarded to successful applicants.